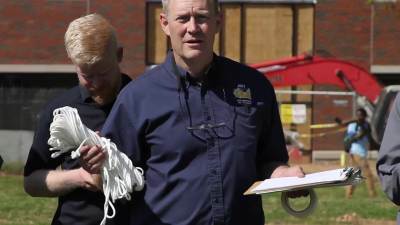 Well, we are hosting the fifth annual Samaritan’s Purse John Brown University disaster shelter competition. This competition is for any school that’s interested to have a team that will design and build a prototype of a shelter that could be used for disaster response. Each team will put the prototype through a series of tests- we do an earthquake test over at the shake table, we do a test to determine how well the shelter will hold heat. Ideally, we want to be able to build it with less than two hours- that’s the time of the assembly- then have someone live in it overnight. Then we have a wind machine from an architectural testing company, then that big wind machine will blow on the shelter. The minimum is 50 minutes an hour, that’s required, and then up to 130 miles an hour. It forces the team to want to work as a team, to look at the whole process of, you’ve got a client you’ve got to think about, okay what do they need, what kinds of things should I build to meet their requirement? And it’s real world application, because it’s not just drawing on a piece of paper. They build a prototype and it really gets tested, so it helps them think through the whole process and really learn a lot more from it.